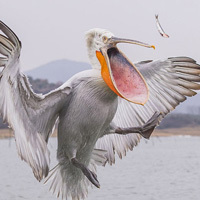 A Dalmatian pelican catches a fish thrown by a fisherman at Kerkini Lake, Greece. During the winter, the fishermen “feed pelicans and help them to survive”. This shot, which appears to show a two-headed pelican in flight, was taken by Vladimir Kucherenko in the Danube Delta in Ukraine. He says he only spotted the strange juxtaposition of the two birds when he returned to his home in Odessa.